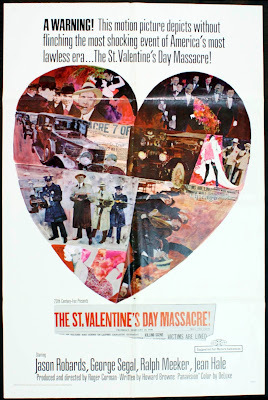 This poster, for the 1967 Roger Corman gangster flick The St Valentine's Day Massacre, ignores the conventions of the prohibition era tommy guns, big suits and wide brimmed hats and instead references Warhol-esq pop art. The artwork by Navarro is minimal but efective being based around the obvious heart motif, echoing the American poster (below). Here's a simple and effective colourful poster from Nico for the 1968 Spanish comedy No Somos de Piedra (We are not made of Stone) which examines traditional gender roles within the Catholic chuch. The plot revolves around the use of birth control pills and looks at the financial impact of children born through unplanned pregnancies. Hence the solitary female subject of the poster positioned in insecure pose, with the title positioned in the womb.